The Freedom Rock at the American Legion Post has bricks available for carving to place around the rock area. 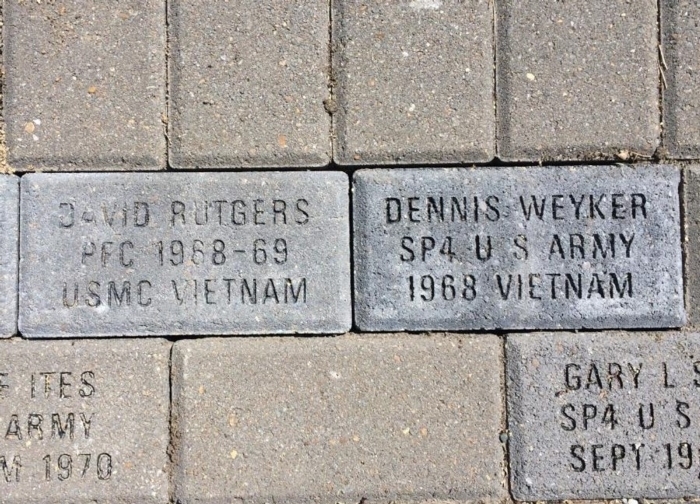 The committee voted to use some funds to place bricks for our two classmates we lost in the Vietnam War. 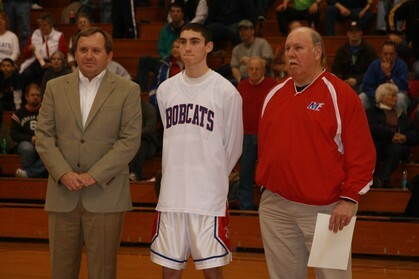 Thanks to Mike Himes and Al Hoop. The first dineout of 2017 is in the books! Zeno's hit another home run. Mike Himes presented the idea for our class to purchase a brick for each of our two classmates on the Viet Nam wall, David Rutgers and Dennis Weyker. The bricks will be placed at the Freedom Rock at the American Legion Post Home. The cost is $50.00 for each brick. We voted to pay this from our treasury. New bricks are added twice a year, before Veterans Day and Memorial Day. I will post pictures when they are placed. 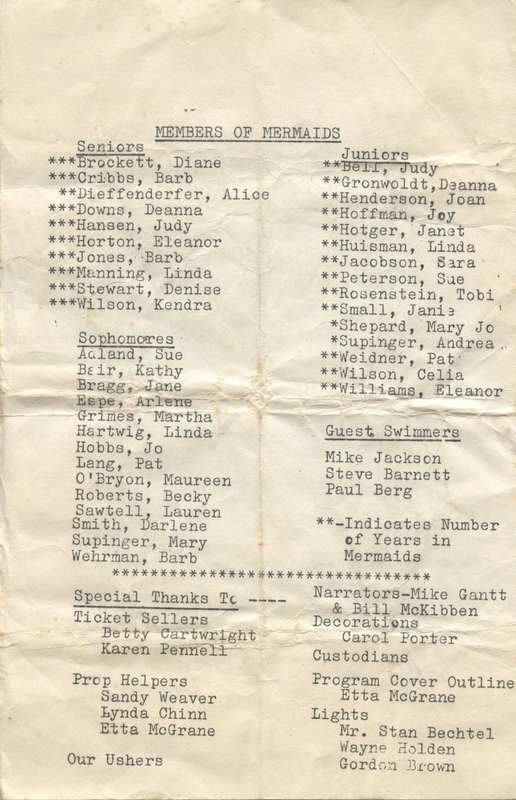 Classmate John Gerwin sent me some memorabilia of our class he has saved. 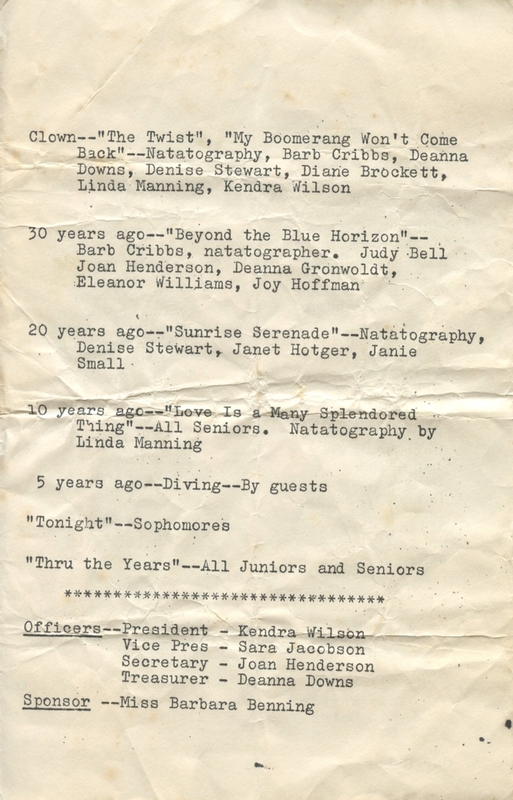 Here is a program from our sophomore year. 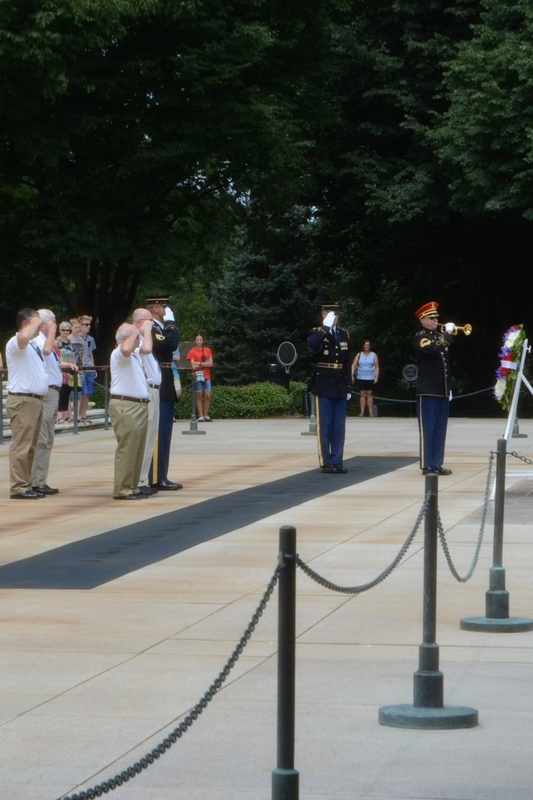 Placing a wreath at the Tomb of the Unknown Soldier at Arlington National Cemetery earlier this month was a great honor for Marshalltown veteran Vic Hellberg. "There's an opportunity to do this on the quarter-hour, between the changing of the guard," he said. "There's a huge process you have to go through. From 1967-72, Hellberg served in the U.S. Navy and manned the USS Seattle AOE-3, a fast combat support ship. 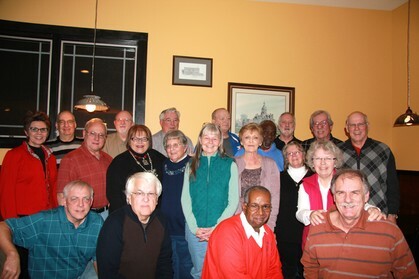 Marshalltown’s Vic Hellberg visited Washington, D.C. earlier this month to honor all those who served on the USS Seattle AOE-3 fast combat support ship in the vessel’s 36 1/2-year life. He and four former USS Seattle crewmen placed a wreath at the Tomb of the Unknown Soldier at Arlington National Cemetery during the trip. Hellberg said he feels a strong connection with other crew members, and a sense of honor for having served on the USS Seattle. The USS Seattle AOE-3 Veterans Association co-founder said he filled out the proper paperwork to place a wreath at the Tomb of the Unknown Soldier, and was assigned a day to come out to Washington, D.C.
Hellberg and three other association members carried the wreath down to the tomb, placed it carefully on a stand, and stood back for a salute. A member of the Navy Band played taps as Hellberg, the crew members, the soldiers and the audience gave a salute. "That was very emotional, to be able to walk across that mat that is walked on by the guards," Hellberg said. "It's an unbelievable feeling." The sense of honor felt by Hellberg comes not only from his time in the Navy, he said, but also from his father's service in the U.S. Air Force in World War II. "My dad was a B-17 ball turret gunner," he said. "My father was the president of his bomber group nationally, as I am of this group." After the visit to Arlington Cemetery, association members enjoyed taking day and night tours of various monuments in the district, as well as a White House tour. 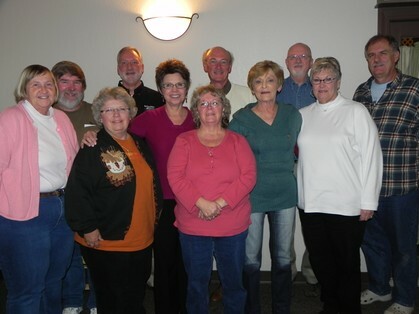 They also got together for their annual banquet. "We go somewhere every year," he said. "This was voted on, that (the association) wanted to go to Washington, D.C."
The association got its start in 2009 when Hellberg and fellow crewman Bill Norris of Houston, Texas, decided to start getting crew members together. 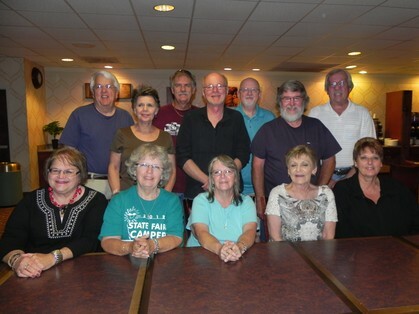 Every year since, the association has traveled all over the country for conventions during the first weekend of August. Hellberg was no newcomer to the nation's capital. "This was about the fifth time I'd been to Washington," he said. "Each time it's been more exciting than the last." He called this year's trip and association convention a "high point" of his life because of the honor of placing the wreath and all the history the city has to offer. "We got 97 people, crew and spouses, at the convention this year," he said. "it's grown every year since we started in 2009." He said the wreath was placed in honor of ship and crew. "It was to honor the service of our ship and all the crew members who served on her in her life of 36-1/2 years," he said. Both Hellberg and Norris were "plank owners," or original crew members of the ship. Both men have also previously been president of the association. Now, Hellberg acts as the official store owner for the group, selling hats, shirts and other memorabilia to members. 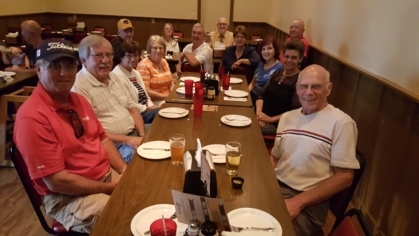 Next year's USS Seattle AOE-3 Veterans Association trip is scheduled for San Francisco, Calif.
"Every one of those guys who come to the convention(s) can't thank us enough for getting this (association) started," Hellberg said. "Each year, it keeps getting better." 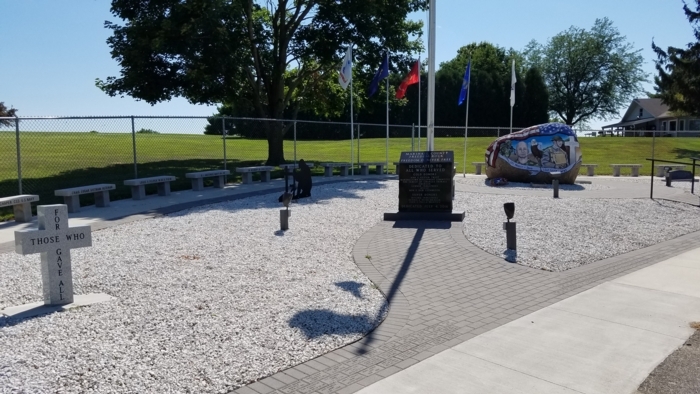 Steve Storjohann steps up again as master of ceremony for the dedication of the Freedom Rock which now resides at the entrance to the American Legion property in Marshalltown. Here the link to the story which ran on WHO TV. 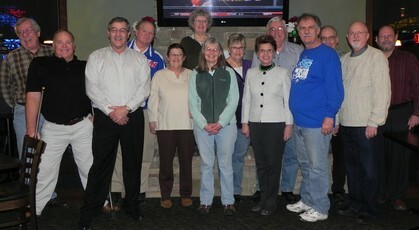 Twelve classmates made it to share some time with Jeff Downing on only 24 hours notice!! 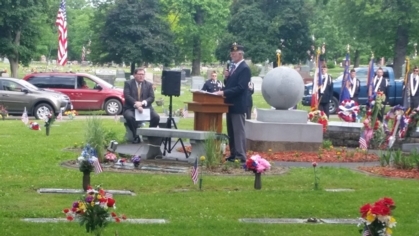 Steve Storjohann has been the leader of the Memorial Day service at the Riverside Cemetery for several years. Good job Steve, your class is proud of your leadership!! Former Marshalltown resident Tom White currently serves as the founder and program director for the Master of Arts in Coaching and Athletic Administration program at Concordia University Irvine. 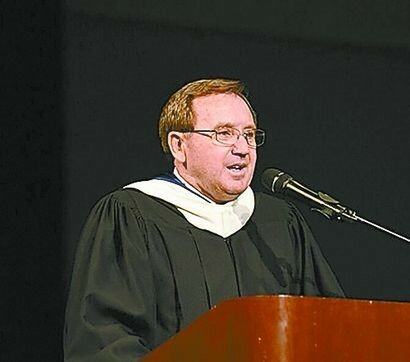 His 46-year professional career involves experience in all aspects of sport: teacher-coach, athletic director, college coach, school district athletic administrator and school administrator. 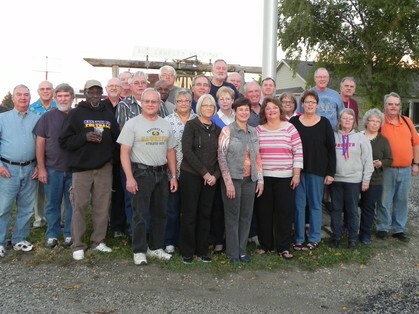 White helped begin the MCAA program in 2005 with nine graduate students. Nearly 1,000 students are currently enrolled in the program. 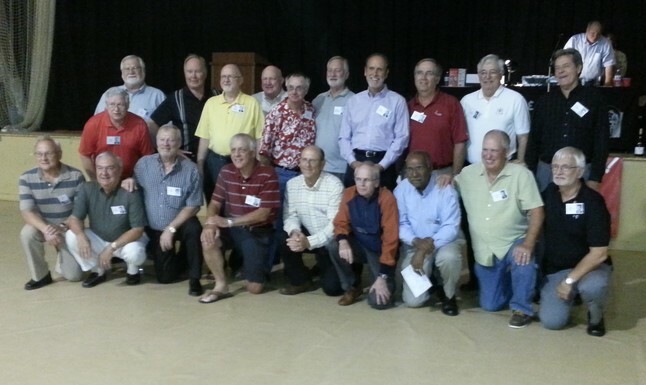 The program has 1,600 alumni in 50 states and eight countries. The MCAA program has become a nationally recognized leader in the field of athletic education, viewing coaching and athletic administration as an academic discipline while responding to and implementing change in the world of athletics. Six Marshalltown area coaches has earned their Master of Arts in Coaching and Athletic Administration degree from Concordia University-Irvine. It is with great pleasure that I appoint KC Hummel as our newest PGR Chaplain. 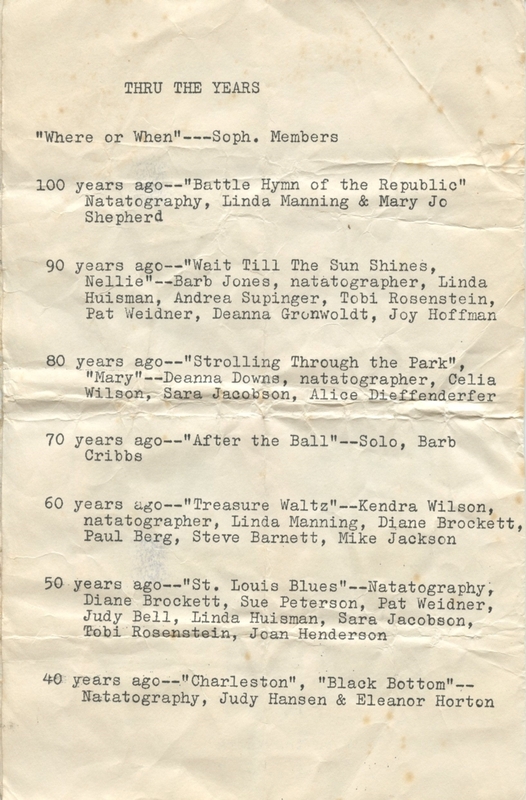 KC has been a PGR member for a long time and the Blue Star Mothers representative for Iowa for even longer. KC Collins Hummel was born and raised in Marshalltown. She graduated from Marshalltown High School and Marshalltown Community College. She attended Iowa State University and graduated with a degree in Fisheries and Wildlife Biology. 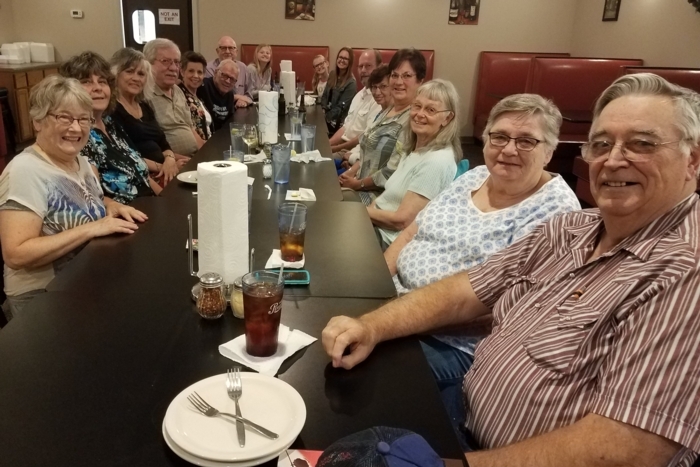 She is married to Don Hummel and they have two children: Heather, a teacher's aid at South Hamilton and Justin, a C-130 navigator in the USAF and three grandchildren. She comes from a family of military members. Father was a 1st Lt in the Army, uncle was a Sgt in the Army (KIA on Luzon), husband was a Sgt in the USAF, son-in-law is a SSGT in the NE NG and son is a Major in the USAF. Volunteer work includes 25 years with Iowa 4-H as a leader and horse competitive event coach; taking 5 state championship teams to the National competition, Sunday School teacher, Youth Group leader, choir member, assistant pianist/organist for her church, Blue Star Mothers of America and the Patriot Guard Riders. Please join me in welcoming her to our leadership team. 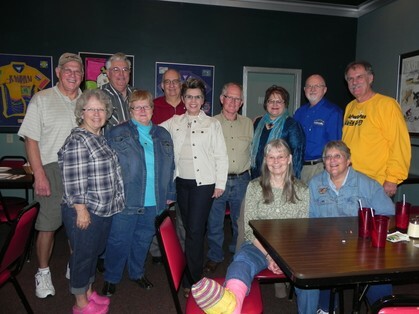 Bobcat contingent at the Arney FUNdraiser. He has a great group of friends and family supporting him. 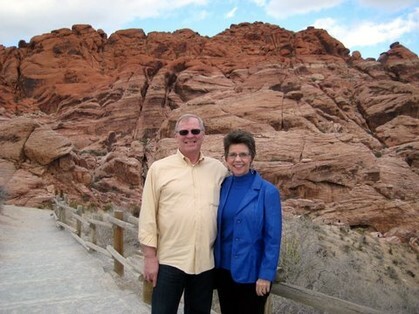 Cheri Hartwig Hayes, John in front (Doug Wheeler left before picture taking). 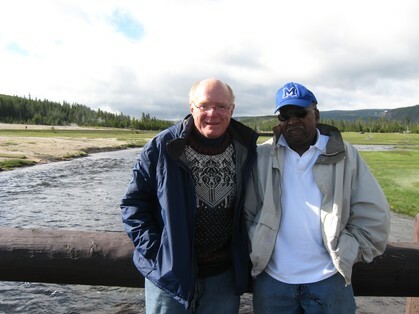 Wayne Bannon and Doug Wheeler in Yellowstone National Park June 15-17 -- seeing the rich and famous in Jackson Hole, and the wildlife and 10,000 guysers in Grand Tetons and Yellowstone National parks. A 57-year-old Garwin woman never thought she would leave a Gladbrook lake as a hero, but last Friday she did. Darlene Tomhave, a retired Marshalltown High School teacher and Linda Brintnall, her longtime friend from Marshalltown, decided to catch up and enjoy a hot summer afternoon at Union Grove Lake. 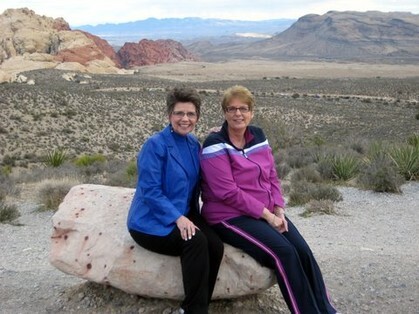 Tomhave and Brintnall were the only people sitting on the beach that day. While the two were visiting Tomhave saw a 6'3, 180-pound man in his early 20s stumbling in the sand to the water. "He was physically kind of impaired," Tomhave said. "He was stumbling in the sand to the water." Tomhave tried to ignore him but she couldn't help but notice him acting strangely in the water. As time passed, he went deeper and deeper in the water. Then he started bobbing in and out of the water and began to cough. "I went to the edge of the water and tried yelling at him," Tomhave said. "I yelled at my friend, 'go try to get some help, this guy is in too deep.'" Within a matter of minutes, the man was floating in deep water and passed the buoys. Out of the corner of her eye she saw four men from far away. Tomhave started screaming at those people for help. The man's bopping began to slow down. "This is a nightmare," Tomhave said. "I've been watching this guy for like 30 minutes and I didn't want to intervene or overreact and make a fool of myself. I just kind of waited. But this guy was in trouble. He was flopping around, past where he could stand up." Tomhave couldn't wait. 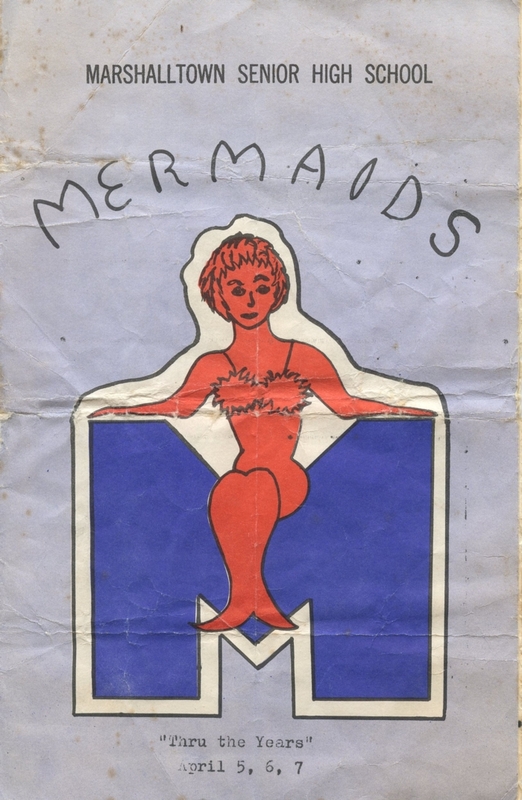 She swam as fast as she could to the man, before the other men could catch up to him. "I was within a couple feet of him and I saw him go down for the last time," Tomhave said. "I didn't want to get any closer because I was a lifeguard and I knew, if you get any closer they could pull you down then you're gone." The four men from the beach and Tomhave worked together and pulled the man out of the water. When the man was finally brought to the shore Tomhave whacked the man's cheeks. After she did this he began to cough then sat up. Tomhave saved the man's life. "My heart was just pounding out of my chest," Tomhave said. "I knew he was seconds away from drowning. I knew if I wasn't there and didn't see him flopping around, he would've been gone. Those men had no idea." The man Tomhave rescued used the restroom at the shelter house at the end of the beach, he was with the men who helped her save him. From there he went on to the beach and into he water, Tomhave said. Tomhave said she regrets not asking who the man was, she said she thinks the group is from out of town. Either way, she knew she was meant to be at the beach that day. "He would've been on the bottom," Tomhave said. "My friend said, 'you're never too old to save a life.'" Tomhave and Brintnall said they hope people will be safe while they are swimming. "People need to use good judgement and be safe around water," Brintnall said. "People should be thinking about and watching for others as well, you can never be too safe." "My life has been a good one," said Wayne Bannon, 66, of Memphis, Tenn. The Marshalltown native was in a reflective mood discussing two careers - one in the Air Force - and another as an educator. Both were extremely rewarding but it his present career as a volunteer that he finds exciting. Bannon, who proudly calls himself a member of the Marshalltown High School class of 1964, doesn't consider his efforts to make a Memphis a better place to live, work - rather, he considers it a blessing in his life. His efforts have ranged from implementing a program which tutored high school students after school to Habitat for Humanity and related housing projects. He found time to help the United Way, the local blood bank and many others not only as a volunteer, but a project manager. Each volunteer initiative gave him the opportunity to meet more people, gain more knowledge and thereby more effectively help those in need. He was a key organizer of the Whitehaven Alliance of Churches and Neighborhoods. 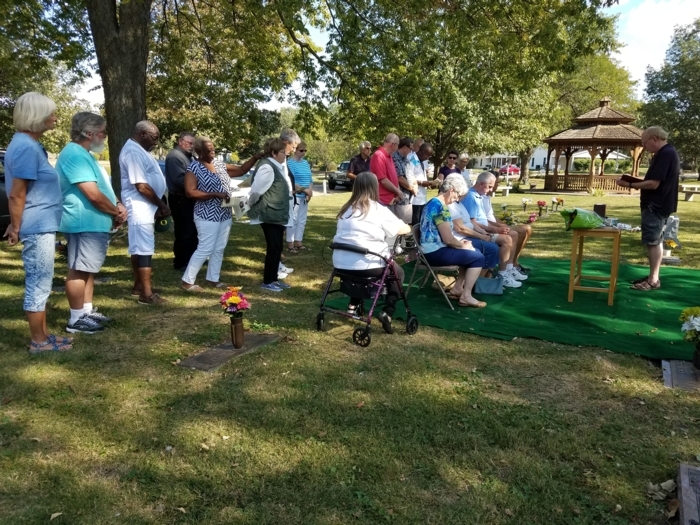 "The goal of the organization is to encourage churches and families in specific neighborhoods to reach out and identify the needs of their community and work together to meet those needs," he said. Bannon help organized the churches to sponsor the first blood drive hosted by the African-American community. He was inspired and has become a 12-gallon blood donor. Bannon and others followed up that success with an opportunity to assist those living in low-income apartments by establishing a mobile dental van for residents, providing GED instruction and holding job fairs. After high school graduation, Bannon took a position with Marshalltown's KIOWA Corp. (now Ace Precision International, LLC). His plan was to have an extensive career at the business. "My plans were to remain there and live a happy and prosperous life," he said. However, a change of heart directed him to enlist in the U.S. Air Force. And that change of heart was life changing, as his military career took Bannon throughout the United States and around the world. Seattle, Amarillo, Texas, Mesa, Ariz. and Ramstein, Germany and finally Memphis, Tenn. were points of call. 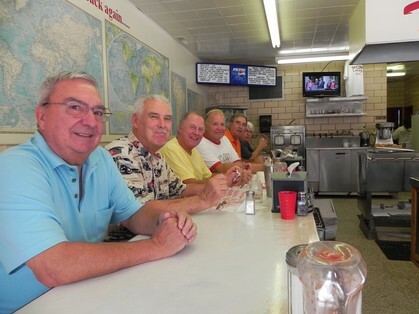 In his travels he met fellow MHS graduates Terry Mellows in Italy and Ron Wooster in Germany. 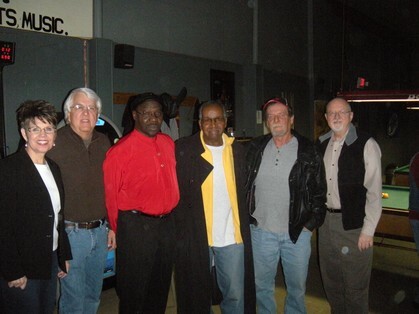 Following his honorable discharge in 1969, he was accepted into a pilot undergraduate program at the former University of Memphis (now Memphis State University). "I have been in Memphis ever since," Bannon said. "But I always will consider Marshalltown home." The pilot program, sponsored by the federal government, paid all tuition if Bannon would commit to teaching physical education in the Memphis public schools following graduation. After graduation, Bannon embarked on a challenging, but rewarding 20-year career as a physical education teacher and football coach. He retired as an educator in 2003, but the organizational skills learned in the Air Force and as an educator would serve him well working with not-for-profit organizations. 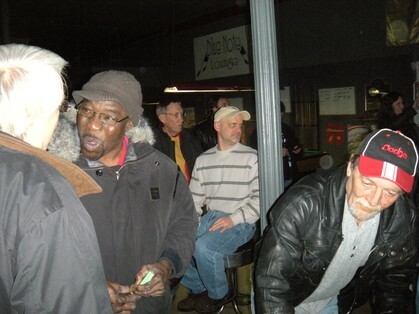 His knack of meeting people with Marshalltown connections followed him to Memphis and took place in the summer of 2012. 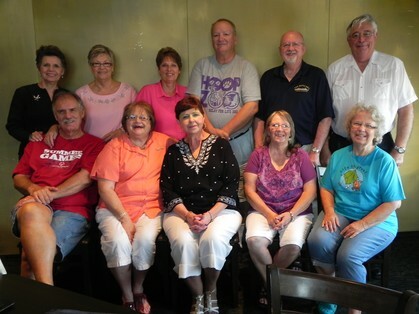 Volunteers with the Catholic Heart Work Camp were in town. Each summer a group of approximately 1,200 sophomores, juniors and seniors works nation wide to clean property, mend fences, repair roofs and a variety of other tasks to the improve the lives and property of those in need. One day Bannon was visiting with a group of the youth from Iowa, Minnesota and Wisconsin. "One such volunteer was Jack Ballaltak of Minnesota," Bannon said. 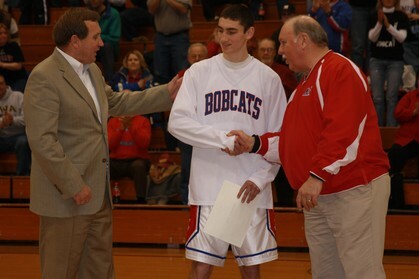 "He is the grandson of Larry and Joyce Ballaltak of Marshalltown. Jack is to be commended for his unselfishness in helping those in need." Vic Hellberg, of Marshalltown, who knew Bannon as a fellow classmate from junior high through high school, was not surprised to learn of Bannon's achievements both in education and as a community volunteer. "I'm not surprised he had a successful career as an educator," Hellberg said. "I think it was a good fit for Wayne. 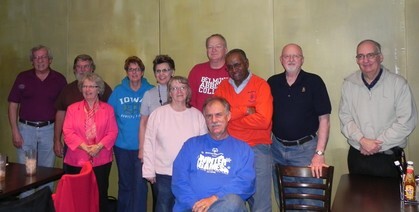 And he returns to Marshalltown once a year to help with our class of 1964 projects. So, I'm not surprised that in retirement, he is still making substantial contributions and helping others." 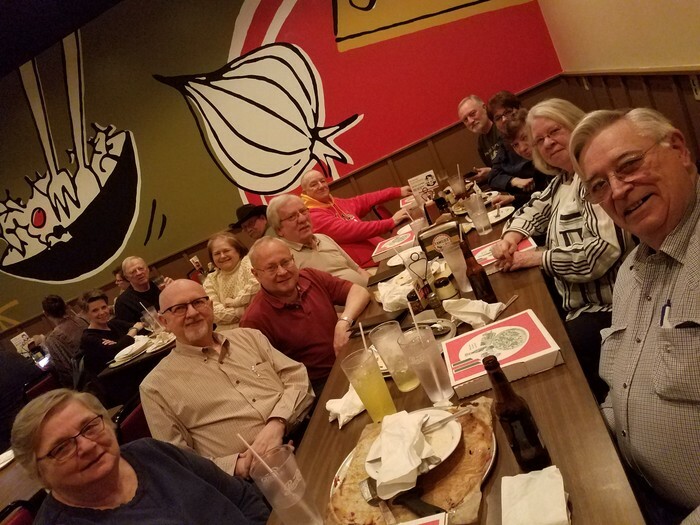 L to R: Jeff Downing, Doug Finders, Jerry Bulanek, Willie Andrews, Vic Hellberg, Al Hoop, Leo Draegert, Ed Morrison, Wayne Bannon, Bob Andrews, Diana Youngblood Muckelroy, Mike Himes, Anna Mae Lolwing Wilson, Steve Storjohann, Susan Berg Rozmarin, Jim Wolfe, Penny Ream, Terry Paul, Tom White, Susan Eker Malloy. 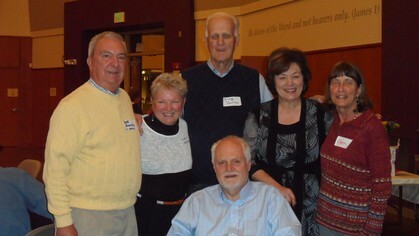 K C Collins Hummel, Patty Gould Duff, Dave Elledge, Jim DeGrado, Jean Detrich Woolf, Kay Momberg DeGrado and Larry Hazen. Steve Storjohann and Vic Hellberg, both past commanders, were honored tonight by the American Legion at its annual birthday dinner. Both legionnaires were presented with life memberships for past contributions to the local post. 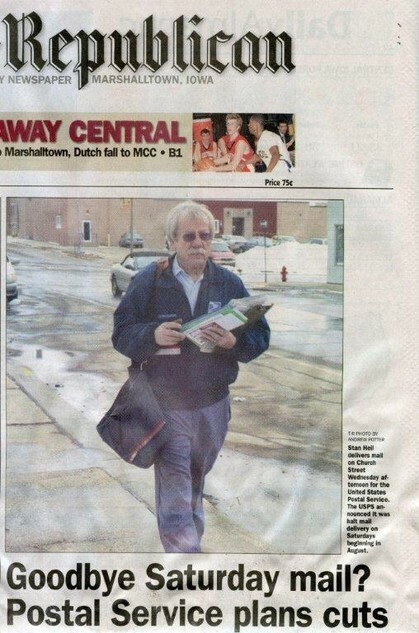 Classmate Stan Heil was on the TR front page the other night!! 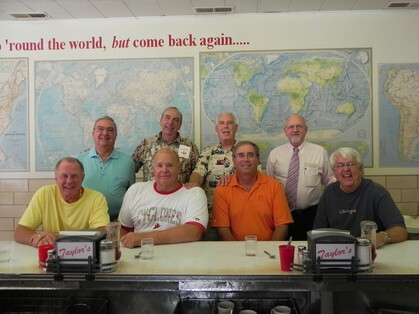 Our picture of this event was on Sunday morning after a wonderful breakfast together. 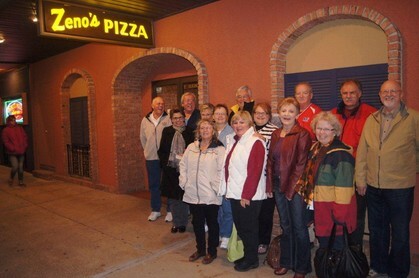 We were having such a good time Saturday evening we forgot to take our group picture with all in attendance. Several classmates took pictures during all three days and they will post in the new BBQ 2012 gallery inside the Class Photo Gallery. Keep checking back to see who has posted pictures. What great stories and memories were shared! 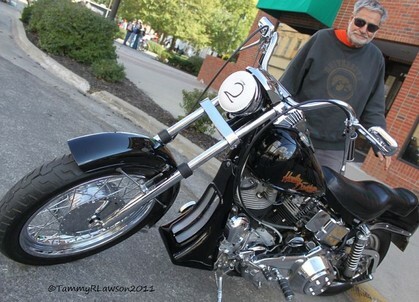 Marshalltown's Stan Thomas readies to mount his 1972 Harley-Davidson Super Glide after winning both the Mayor's Choice Award and First Place Vintage at the conclusion of Sunday's Motorcycle Show & Rodeo. Second annual "Barbie" ruled a complete success. As always, this generous class has risen above expectations. 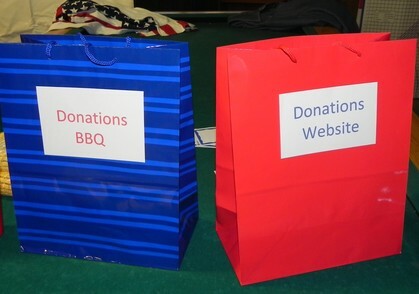 We placed donation sacks out for our website and the BBQ costs. Expenses for the BBQ were $480.00 and you gave $576.00. The cost of the upgrade of the to our website was $396.00 and you gave $575.00!!! Much of the website donations came from our long distance classmates. As always you go above and beyond!! Now Joe has a couple of hundred dollars seed money for our cookbook. Stan Heil, Larry O'Neal. 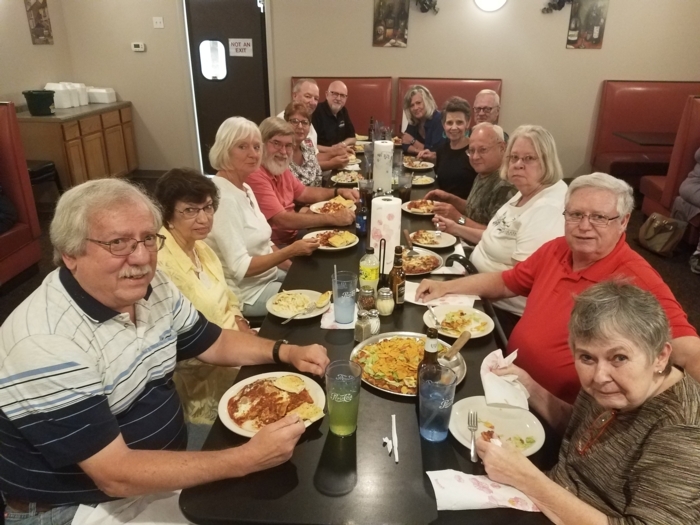 Gene Gall, Al Hoop, Sam Vint Halter, Kay Momberg DeGrado, Debbie Garland Johnson, Diana Youngblood Muckelroy, Pat Lang Helfer, Leo Draegert, Jim DeGrado, Marion Doggett, Vic Hellberg, Tom Swartz. 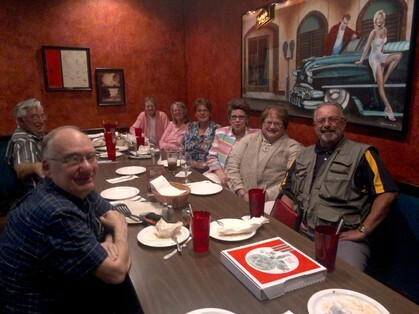 Twelve classmates ate together on December 30th at Joe's Italian Grill. 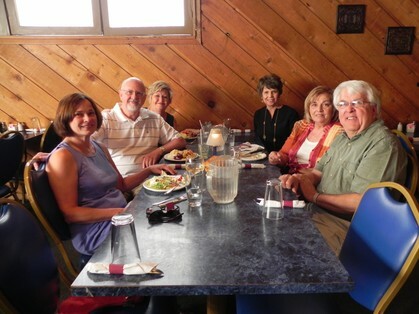 Great fun, good food and two new classmates joined us for the first time. Again several were still visiting when the restaurant closed. It was also fun to talk to Joe Childs who almost flew in from Phoenix to join us. I think most of us jumped on the cell phone to visit with Joe. Keep watching here for further announcements. Please send ideas that could get you to join us to: info@mhsclassof64.com. 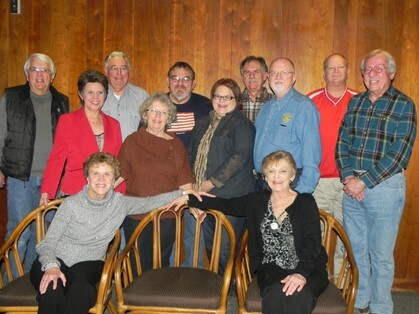 Your committee has three new members, Nancy Brees, Jerry Bulanek, and Bill Andrews. The successful BBQ has been renewed for 2011. Mark you calendar for Sept. 16 and 17. More information will be forthcoming as plans are finalized. Where else should it start??? If anyone plans a visit to Marshalltown, send me notice early so we can plan ahead. 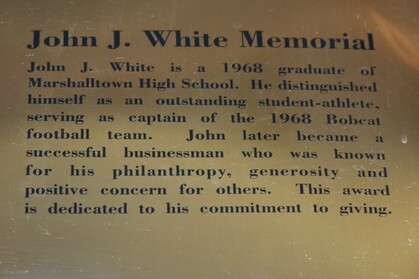 Classmate Tom White's brother has a scholarship given as a memorial in his name to a student football player each year during a basketball game. Tom comes home approximately every two months to check on his mom. On his last trip they both attended the presentation at the round house. Jim DeGrado took these pictures for us. 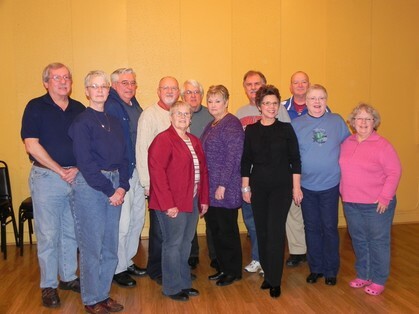 Members of the Marshalltown High School Class of 1964 present the MHS Journalism Department a monetary donation in the memory of classmate Biff Dysart. 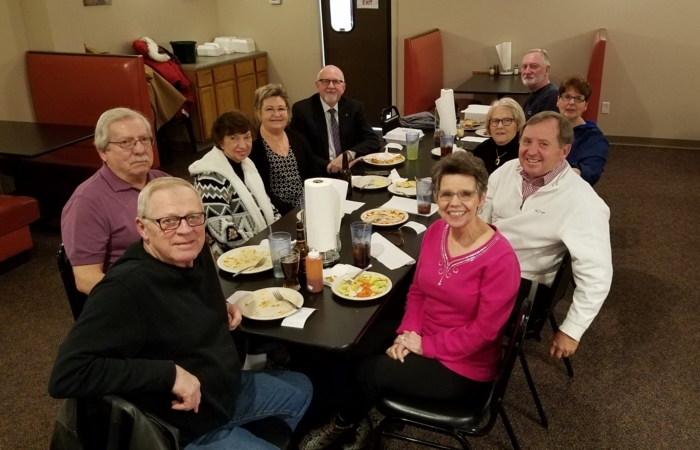 Pictured from left to right are, Pat Helfer, Pebbles newspaper editors Kelsey Beurskens and Samantha Gill, Wayne Bannon, Vic Hellberg and Leo Draegert. 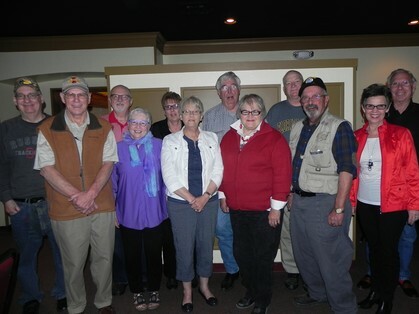 A monetary donation was presented to the Marshalltown High School Journalism Department in memory of 1964 graduate and Pebbles Editor-in-Chief Paul “Biff” Dysart. MHS Principal Bonnie Lowry said that Dysart enjoyed keeping up with various activities at MHS. “He always drove one of the convertibles in the Homecoming Parade,” she stated. 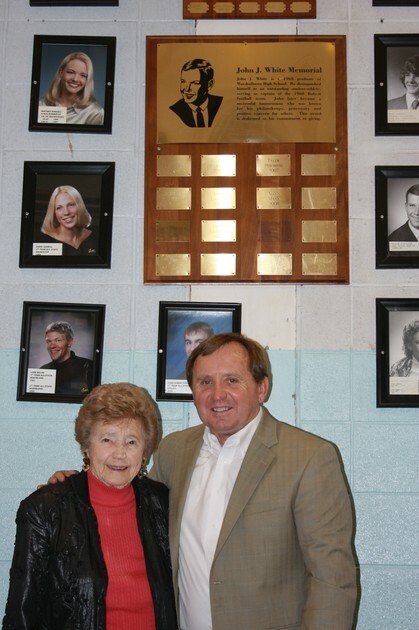 According to Dysart’s classmate and 1964 graduate Pat Helfer, he was a very innovative individual. “He was a dedicated and loyal person to the community. He served on the city council and did a lot of behind the scenes work,” she explained. 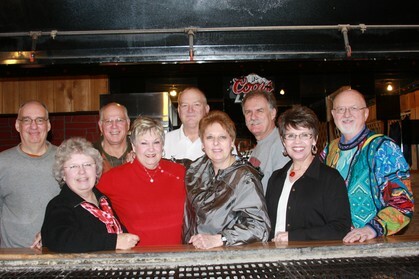 Denise Andrews sucessfully pulled off a surprise birthday party for Willie's 65th birthday. 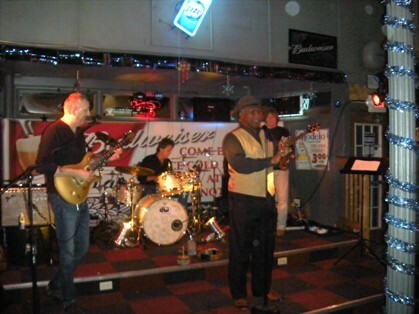 It was held at the Blue Note Bar in downtown Marshalltown December 26th. I have posted a couple of pictures of the event. Several classmates were on hand but most in attendance were family and friends including family from as far away as St. Louis. 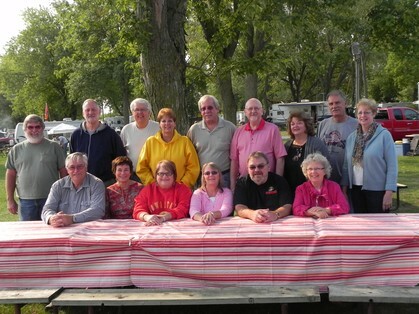 The entertainment was class of 65 exceptional singer Steve George and his group. Denise also had cooked up a storm and had a huge buffet for us all and a few extra Blue Note regulars and Steve George followers who were also in attendance. 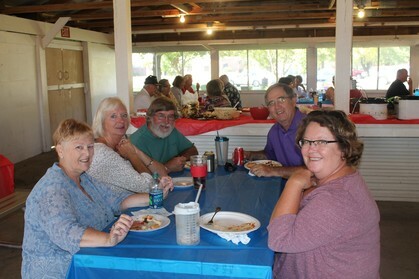 Several remarks were heard that the BBQ ribs were the best they had ever eaten including my wife. 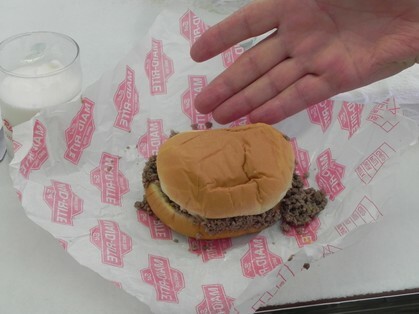 The only exception to those sentiments was expressed by Willie who said his were better!! A good time was had by all.